Deer are weird (even if we disregard persistent reports that one particular species, the reindeer Rangifer tarandus, has a seasonal capacity for load-bearing flight). Roe deer, for example, practice delayed implantation – where the fertilized egg undergoes a few divisions and then waits, for several months, before implanting in the uterus. As a group, deer also have an unusually dynamic karyotype. Closely related deer species can have as few as 6 chromosomes or more than 70, with chromosomes breaking apart and fusing at a rate that makes karyotype evolution in other mammals look positively pedestrian. Less well known but no less remarkable is the fact that many species of deer have sickle-shaped red blood cells. This is odd because, in almost all other mammals, from mice to whales to humans, red blood cells are of a similar size and have the familiar doughnut shape that helps them squeeze through small blood vessels and deliver oxygen to cells in need. What’s more, deer do not seem to suffer any ill effects from carrying these sickle cells in their blood stream. 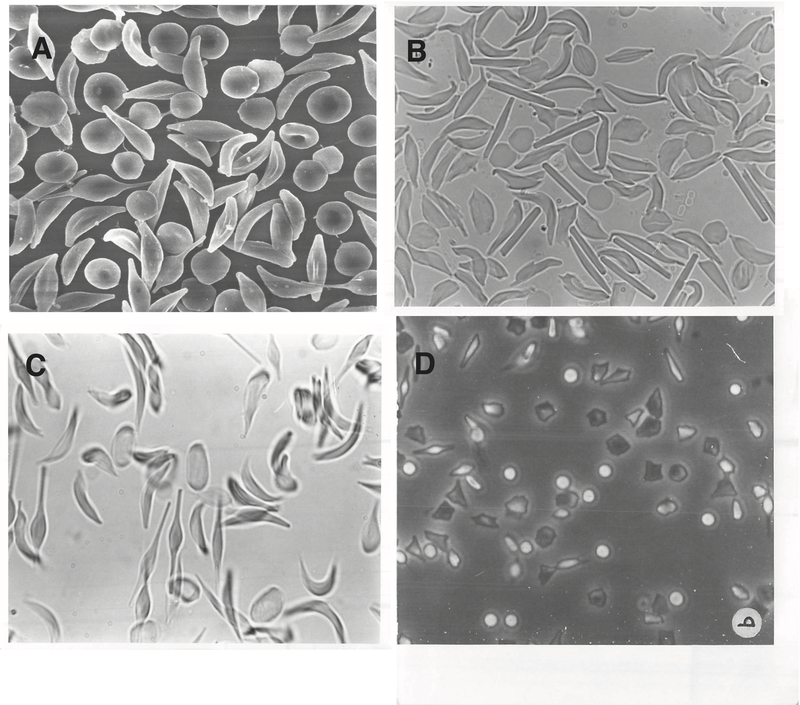 In contrast, humans with a sickle cell phenotype suffer from debilitating anaemia. Blood smears of (A) swamp deer (Rucervus duvaucelii), (B) Père David's deer (Elaphurus davidianus), (C) red deer (Cervus elaphus), and (D) Dorset Down sheep (Ovis aries) at different magnifications. Images courtesy of P.D. Butcher. I learned about deer red blood cells entirely by accident. Flicking – as one does – through a 500-page monograph on blood crystals (Reichert and Brown 1909, if you must know), a hand-drawn figure (reproduced below) caught my attention and didn’t let go. It displayed the variability in sizes and shapes of vertebrate red blood cells. As you can see for yourself, most mammalian red blood cells are boringly uniform, with one exception: evolution seems to have gone a bit nuts in ruminants: tiny cells in chevrotains (a group of badger-sized mammals that look like a cross between a deer and a tapir), oval cells in camels, and – strikingly – sickle-shaped cells in white-tailed deer (Odocoileus virginianus, then known as Cervus mexicanus). 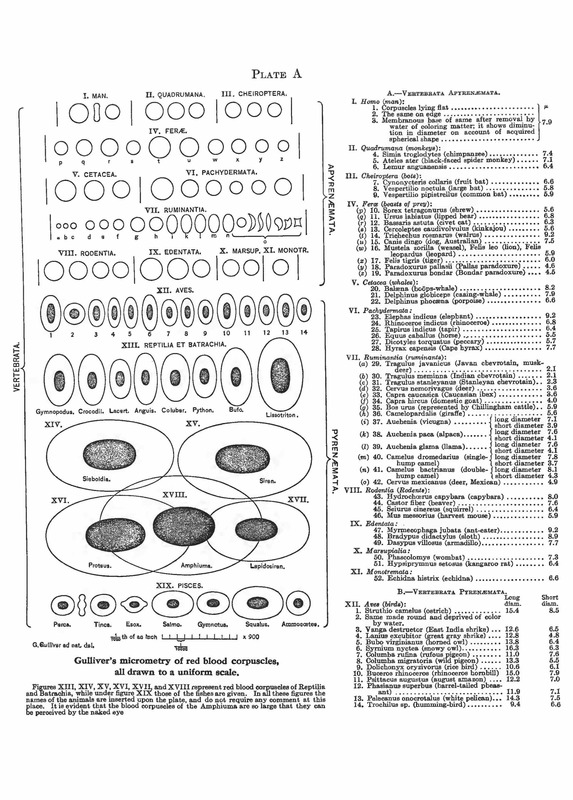 Gulliver's micrometry of red blood corpuscles. Reproduced from Reichert and Brown (1909). The man who made that drawing was former army surgeon George Gulliver. In the typical Victorian manner of a curious collector and collector of curiosities, Gulliver had measured countless red blood cells from any vertebrate he could get his hands on, with London Zoo his main hunting ground. He eventually published his observations in 1840, a whole 70 years before sickling was first described in humans. It then took a further few decades before the morphological similarities between human and deer sickle cells sparked a flurry of comparative studies. In the 1960s-80s, different groups showed that sickling in deer occurred in vivo and involved the same protein in both species: beta-globin, a key unit of the haemoglobin complex that binds, carries and releases oxygen. But the molecular basis of sickling in deer remained unknown. In humans, a single mutation changes the beta-globin protein and predisposes it to interact with other beta-globins, giving rise to haemoglobin fibres that end up so long and strong that they distort the shape of the cell. In deer, however, that particular mutation (a change of glutamic acid to valine at the sixth position of the protein, or E6V for short) had not been found and the genetic basis of sickling in deer remained unknown. As much as anything, this was probably a case of bad timing. Whereas decoding DNA sequences is routine today, this was not the case in the 1970s and 80s. With the literature on deer sickling in hiatus from the mid-80s, I thought we could add something informative by sequencing the beta-globin gene in different species and comparing sequences from deer that sickled with those deer species where sickling had not been observed: the frosty triumvirate of moose, reindeer, and wapiti. I also thought that this would be a nice side project for my PhD student Alexander (Sasha) Esin, whose main project on horizontal gene transfer included a soul-destroying amount of reconstructing phylogenetic trees, where rewards can be rather intangible. And so, we started collecting blood and tissue samples from various zoos and freezers around the UK, including the sizable one (freezer, not zoo) of Vincent Savolainen, a colleague at Imperial College, who had collected deer tongues* from species around the UK, including long-term natives and recent thriving escapees like Chinese water deer. Sasha then extracted DNA to hunt down the adult beta-globin gene. In the age of genomics, that sounds more trivial than it was. When we started, we did not have a single deer genome as a guide and globin genes are annoyingly prone to duplicate and recombine, leaving a host of closely related decoy sequences in the genome that we did not want to fish out. Thanks principally to Sasha’s persistence, we ended up with beta-globin sequences from 15 different species and could start looking at differences between sickling and non-sickling deer. Then, as the sequences started to roll in, I went to Cambridge to ambush Joe Marsh. I felt that to really understand the relationship between genetic differences and sickling, we needed a structural perspective and I admired Joe’s work modelling protein-protein interactions. We had both signed up for a conference on Evolutionary Systems Biology and, in the splendid isolation that is the Wellcome Trust Genome Campus in Hinxton, Joe was a sitting duck and, fortunately, turned out to be game. *Why tongues? Vincent assures me that the reason for collecting tongues is practical rather than morbid. It’s a part of the animal that’s easy to access and only present once. That’s a useful property when studying genetic diversity and relying on volunteer hunters to take samples for you. Labelling mistakes happen. But whereas two ears in your freezer might conceivably belong to the same individual, two tongues will most certainly not.